Reader Amy Jacobsen asks a great question that just happens to be very timely. It’s a great question because it’s a question a lot of us might have: how do we get a Social Security number of a parent, or grand parent, or great grandparent? And it’s timely because there’s a new resource available that might help. Now we all know, as the Social Security Administration says, that the purpose of the number was and is to track worker earnings5 — but that it’s also been used for almost every conceivable other purpose to help identify and distinguish people. Which makes it amazingly useful to genealogists — a simple way to tell this John Smith from that John Smith. So… where can we find these numbers for our deceased family members? First, look through our family papers. It’s likely that we’ll find the SSN all over the place, and we may even find our loved one’s original Social Security card. It’s sure worth checking there first, before any other option. The SSDI doesn’t include everybody who ever had a number, and because of changes in federal law won’t include anyone who died after March 2014 until three full calendar years after the death.6 And some online sources won’t include the SSN for anyone who died within the last 10 years. Even with those limitations, it’s still a good place to look, entering as much information as we have about a family member into the various search fields. Finally, you can file a request with the Social Security Administration itself for a copy of the person’s original application for the SSN (called the SS-5 form) as long as the person died more than three years ago. Because of that change in the law, the SSA won’t provide any information for anyone until three full calendar years have passed since the death. And once you get any SSN, for anyone, at any time, don’t forget the privacy issues here: SSNs are used today to identify living people, and we should never ever ever post or share any SSN online or in email or anywhere else where it could possibly be misused. A little common sense, a little caution… always the way to go. Are you aware Ancestry.com has this new database since July 22nd? Um… er… uh… David…? Did you read the paragraph that begins with the word “Third”…? Don’t forget that amongst papers, An old Medicare card will have the SSN as it uses it as the Medicare ID. Yep, lots of papers will have that SSN. With regards to living people, absolutely. I’m trying to get my two young adult children to memorize their SSNs so they never have to have it written (or typed in their phones) anywhere. However, if a blogger decides to blog about something he or she finds in this new ancestry.com database, it shouldn’t be a problem to share that SSN, since it’s for a dead person, correct? It’s not a legal problem, Elizabeth, but the sensitivity that many families have about their own loved ones suggests to me that it’s really not a good idea ever (ever!) to include a social security number online, except when it’s something like the one I included in this post (the lowest number ever). We’ve already lost the fight for access to some SSDI information, and every time a politician sees even an old, defunct SSN online, the risk escalates that we could lose more. So caution is the watchword here. Thanks for the clarification – much appreciated! Since 25 June 2011, new Social Security numbers issued have been entirely random. The first three digits no longer convey any information about the state where the card was issued or where the applicant lived. During the first 20 years (@[email protected]) were there groups of people that were excluded from signing up or drawing benefits such as women who never held formal jobs? Was signup perhaps limited only to males who held formal jobs? Or to people who filed tax returns? When was a SS# required to file a federal tax return? Why would there be no record of a man who was @66 years old in 1936 who died in 1947 ever having a SS#? And lastly, any idea whether the database just released is complete or is there more to come? My grandmother, who never worked outside the home, applied for a SSN in 1954, because she would be able to claim benefits against my grandfather’s work history. She applied under her married name, and had to provide proof of her identity–because of this she applied for a delayed birth certificate, and I know when she registered to vote! Someone who was 66 in 1936 would already have been retired and not have paid into the system. Also someone who has not reached retirement age by the time they died (in the earlier years) would not have been included either. Those who worked beyond that age, however, sometimes did register, even though they weren’t supposed to. So it’s worth checking no matter what. This link was in my blog earlier this week. Can you help clarify what the term “life claim” means in the new Ancestry database? I’ve seen lots of guesses…. 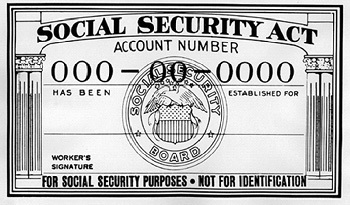 The term doesn’t appear to be defined in the Social Security Act but is used by the Social Security Administration on its internal documents (there’s a check-off box for a child’s insurance benefits, for example, where the application has to indicate whether it’s a life claim or a death claim and there are references in the SSA policy manual to “life claim” but without defining it). It appears to refer to retirement benefits, but that’s not at all clear. Thanks. There must be some criteria for choosing “life” or “death” on the child’s application, but apparently the distinction is so obvious as to be undefined. And that leaves the rest of us wondering…. If you find a SSN in documents with a letter after it, if it has any letter but an A it is not that individual’s SSN. It means he or she is drawing benefits on someone else’s number. An example would be a wife drawing Medicare on her husband’s account, with a B after his SSN. There are a lot of other codes, C for child, D for divorced spouse etc. An ancestor applied for a SS life claim in 1934. Can a family member get a copy of the life claim? If so, how does ones apply for the document? Thanks. You can make a Freedom of Information Act request, but be aware that the Social Security Administration is — to put it mildly — hostile to genealogists and will likely fight any effort to expand the records it makes available beyond the SS-5. I have the social security number from a 2nd husband of a relative because we have 2 “Certificate of Social Insurance Award” letters. The first in 1946 when he began receiving benefits and the second in 1951 when his widow stared receiving benefits. One claim number has an “A”, the second has a “B”. The problem is that I can’t find him in the SSDI at ancestry.com when doing a lookup by the ssn (without the A or B). I also can’t find him by searching on his name and year of death. Do you have any ideas on how to find the records? Or any ideas as to why the lookup fails? The SSDI isn’t a comprehensive list of everyone who’s ever had a Social Security number and has died, or even everyone who’s ever gotten benefits and then died. You might want to review this resource from Ancestry to better understand the limits of the SSDI, especially the part Why can’t I find the person I’m looking for? Thanks. That article was very interesting and useful. I found him in the Social Security Applications and Claims Index by searching for his exact social security number without the – (dashes). Very curious since I was able to get their search to work for some cases including the -. Excellent! Glad you found him! I still don’t know when he died. I can’t find him in the ssdi or the social security claims database after his death. I know there was a claim by his widow who started receiving wifes’s Insurance Benefit beginning March 1951. Very frustrating. He had a common Jewish name, lived in the Bronx and was born in the Soviet Union. There were literally dozens of people with his name in the Bronx in the 1940 Census. If genealogy was easy… it wouldn’t be so much fun! I am researching family of a civilian gold miner who joined the Guerrillas in WW2 in the 121st Infantry Philippine Army Regiment which was overseen by the US Military. He went missing in action and was executed in 1943. Since he was out of the US from the 1920’s for wok, it is unlikely he ever obtained a social security number. I located the name of his wife applying for a life claim in 1967 which would have been when she was 79 years of age. I am not certain if this is her or not. How might I determine this? Do we know how the SSA determined benefits for people like this who perished in WW2? This man actually received the Purple Heart and Bronze Star Medal and is on the American Cemetery Wall of the Missing in Manila so clearly the US recognized his heroic death. Quite a mystery! You should order the SS5 (application for social security number) for the woman in the 1967 claim to get the information about who the person was. It’s a $27 charge since you have the SSN. You can then compare the parental information with the known data that you have for her. I doubt that her benefits were based on his service in any way, but rather will be based on her own situation. Can a genealogy site put someones ssn on their website without a family member permission? Can they? Yes. Many SSNs become public because they’re on death certificates or on the Social Security Death Index. But we should all take great care never ever to put the SSN of a living person online for any reason. I am not familiar with the US Social Security system but I have a Life Claim record for a cousin who lived in Michigan. From the comments I’ve seen here it would seem that this is some sort of benefit claim. The claim was made in 1954 when she turned 65. Both she and her husband were still alive in 1968. Yes, that’s likely the start of her retirement benefit. You could obtain her SS-5 (application for a social security number) once she is deceased for more than three calendar years. I have found a person of interest in Ancestry’s Social Security Applications and Claims Index. It has his exact DOB and a “life claim” date of 1 July 1952. Is that his date of death? If I pay the $27 for the SSA-711 Computer Extract of Social Security Card Application will I learn anything further of his death, e.g., where it occurred? A life claim in general was when the person sought retirement or disability benefits, not death benefits. The SSA application will not provide death information; it’s an extract of data created when the person applied for a Social Security number for the first time. Regarding: Social Security Applications and Claims Index, 1936-2007. What does “Claim Date” represent? What does the date in the “Notes” represent? I know my great-grandfather’s Social Security Number, how can I get his Date of Death? Claim date was usually the date the claim was submitted. The date in the notes will vary depending on what the note says. For date of death you can check to see if your great grandfather was included in the Social Security Death Index (a separate research tool on both Ancestry and FamilySearch, among others). It’s not always there and not always obvious, and then you have to keep researching in other sources like obituaries and state or local death records.